The problem. A couple of weeks ago an email was forwarded to me from another Extension employee that had fielded a call from a local ag service provider. The service provider was seeking guidance after having visited a client’s soybean field and encountering plants exhibiting unfamiliar symptoms. 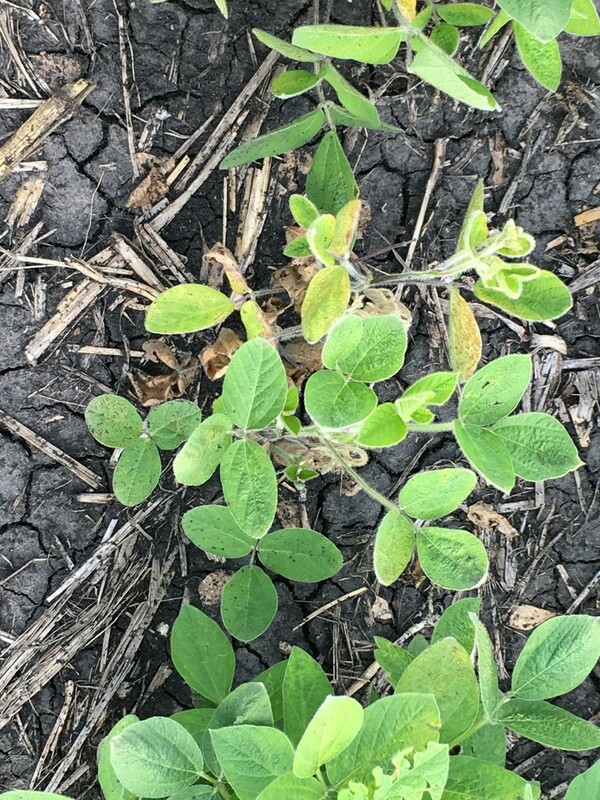 What was particularly puzzling (and worrying) to the service provider was that plants appeared to have symptoms caused by Phytophthora sojae but the soybean variety had both field or adult-plant resistance and pathotype or race-specific resistance genes to P. sojae. Bacterial cells and either spores of true fungi or fungus-like organisms like Phytophthora are individuals in a much larger population. During processes such as the genetic recombination that occurs during sexual reproduction and the random mutations that occur during cell division, new spores will be genetically different from their siblings. Some may be better able to survive and cause disease on plants that have genetic resistance to the vast majority of other spores in that field. Long story short, it was not out of the question that a shift in the Phytophthora population may have occurred in this soybean field. The next step was to take a scouting trip to inspect plants in the field. Field visit. While at highway speed plants may have appeared perfectly healthy, walking into the field about 50 yards revealed large gaps where plants had long since wilted (Figure 1). Speaking from experience: nothing is more frustrating than trying to figure out what is responsible for killing plants that have been dead for weeks. While some microorganisms can act as pathogens, others -called saprophytes- live on dead and decaying plant tissue, complicating our desire to determine the cause of death. Figure 1. Patches of dead plants. But, what caused their death? Often when environmental conditions are generally favorable for disease, there may be some plants that may have grown in the ideal disease microenvironment or may have been infected earlier or with more pathogen inoculum than their neighbors. These individuals will die first. Other plants may have grown in a microenvironment a little less favorable for disease development, initially been infected later or with fewer pathogen cells. These individuals may have more mild symptoms of disease which can help in diagnosis (Figure 2). Other plants may never become infected and will remain healthy all season long. Figure 2. Plants that neighbor the patches of dead plants may also be diseased but may not have yet died as a result. Their symptoms can give us clues as to what may have caused the death of the neighboring plants. Focus on finding those symptomatic plants that neighbor those that have died. These plants may provide clues as to what is responsible for causing the symptoms. Whether you are trying to diagnose the disease yourself or plan to send plants to a disease clinic it is important to dig and not pull up plants (Figure 3). Figure 3. Be sure to dig plants to get a look at the roots - many plant pathogens initially infect the plant below-ground. Inspecting the plants up close. As becomes very apparent, particularly on cloudy days, it is of value to bring representative plants back the office, lab or home to get a closer look. 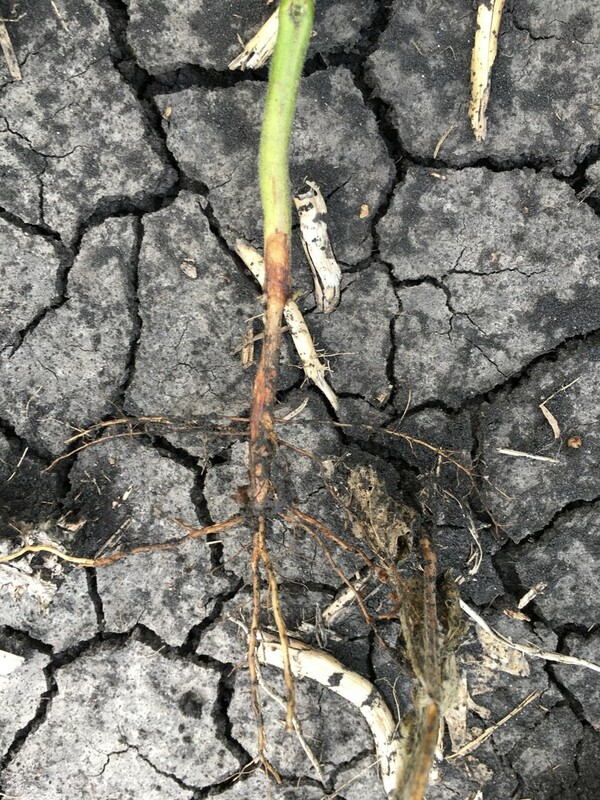 These plants had externally damaged and discolored taproots and few lateral roots with poor nodulation. There were also lesions that extended from the roots and onto the lower stem tissue. They were sunken (not flush with the healthy part of the stem) and reddish-brown in color (Figure 4). Figure 4. 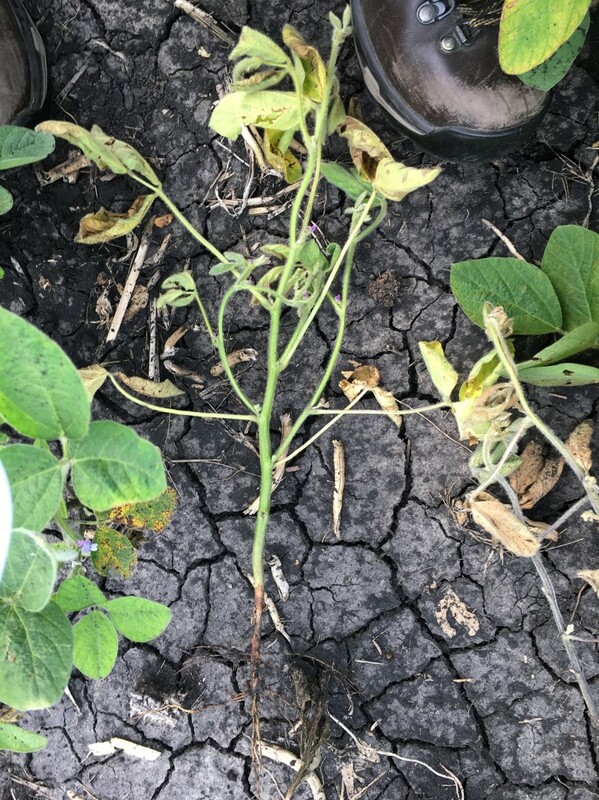 Symptoms: sunken, reddish-brown lesion growing up from root lesions and onto the main stem, discolored taproot and lateral roots with poor nodulation. Getting a second opinion. While my education, experience and instincts were all screaming that these were symptoms of Rhizoctonia root root, I decided to confirm my suspicions by sending them to a laboratory for diagnosis. Because the cause of Rhizoctonia root root, a fungus called Rhizoctonia solani, can cause disease on sugar beet, dry beans and corn, an accurate diagnosis is important and will implications for which crops are more likely to thrive in this field. 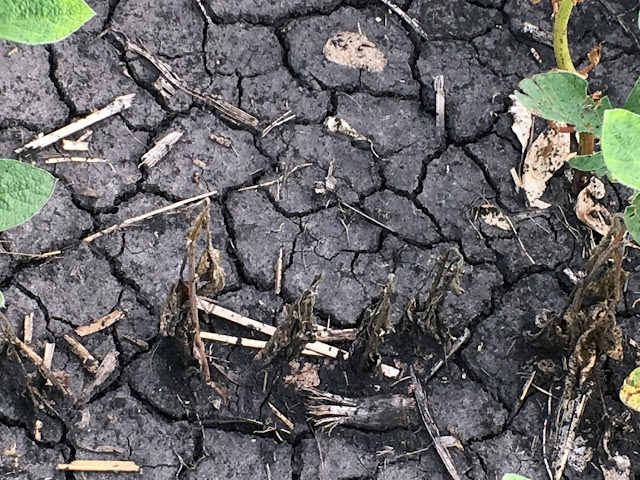 If however the cause of the root and stem lesions was P. sojae, a fungus-like organism that only attacks soybean, dry beans, corn and sugar beet are all good 2019 crop choices. At the lab workers surface sterilized and cut up the plant, capturing the dividing line between diseased and healthy tissue (Figure 5). They then placed these small stem pieces onto a Petri plate filled with a plant-based gel, specific nutrients and antibiotics – this growth medium allows fungi to grow but keeps bacteria from growing. After incubating the samples for a period of time workers looked at the growth characteristics of the organism that grew out of the diseased plant tissue and onto the nutrient gel under a microscope. They were able to make a diagnosis. Figure 5. Workers at plant disease clinics will focus on surface sterilizing and plating onto growth media the border region between diseased and healthy appearing tissue. The verdict. The plants were indeed suffering from Rhizoctonia root rot and consequently the recommendation would be to plant small grains in this field in 2019. University of Minnesota Plant Disease Clinic.